SpaceX aims to clinch a third of all US National Security Space missions. 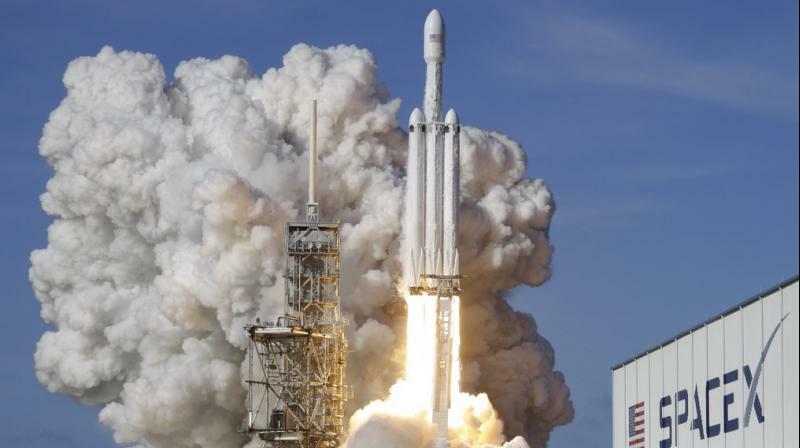 The most powerful operational rocket in the world, SpaceX’s Falcon Heavy, launched its first commercial mission on April 11, from Florida in a key demonstration for billionaire entrepreneur Elon Musk’s space company in the race to grasp lucrative military launch contracts. The 23-story-tall Heavy, which previously launched Musk’s cherry red Tesla roadster to space in a 2018 debut test flight, blasted off from Florida’s Kennedy Space Centre carrying its first customer payload. “T plus 33 seconds into flight, under the power of 5.1 million pounds of thrust, Falcon Heavy is headed to space,” SpaceX launch commentator John Insprucker said on a live stream. Roughly three minutes after clearing the pad, Heavy’s two side boosters separated from the core rocket for a synchronised landing at the Cape Canaveral Air Force Station, sparking boisterous cheers from SpaceX engineers in the company’s Hawthorne, California headquarters. The US Air Force tapped SpaceX in 2018 to launch for USD 130 million a classified military satellite and in February added three more missions in a USD 297 million contract.